aww this soo cute, who would wanna eat that! Yummy !! Nice cake !! SO cute!!! I would love a cake like that. Wonder if Gandalf tastes good ...? I love it! One of my favorite books and Gandalf is my favorite character! A very beautiful idea and cake! Very nice, the flowers and door are exceptionally well done. Oh my gosh!! Yes, this is perfect!! I will maybe try to attempt to make one like this for my birthday next week, haha! Almost too good to eat! Love it! Brilliant! Such a lovely little cake It has quite an endearing charm to it - as a hobbit's hole should. Okay. This is amazing. It's such a simple design, but it's so, so effective. If I had a cake like that, I wouldn't dare to eat it... cute! And then, in the next scene, Gandalf went and carved a little "G" rune in the door to give the Dwarves a meeting point! What kind of cake do you use for the "inside" ? How many time to realize ? that's awesome... and probably very very sweet. I would eat that Gandalf. AAAAH! It's so cute!!!!! I want one for my birthday XD Must learn how to use fondant and molding chocolate! Awesome! 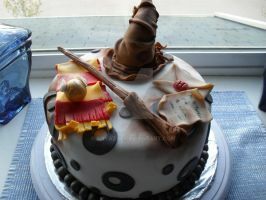 if someone made me a cake like that, I'd find a way to varnish it and keep it forever!!!! C'est super ! Continue comme ça! Just like how Gandalf's appearance foreshadowed the end of Bilbo's hobbit life in the book, so does his appearance foreshadowed the doom of this cake. where is my precioussssss !! !